First of all, welcome to Bookourplane. 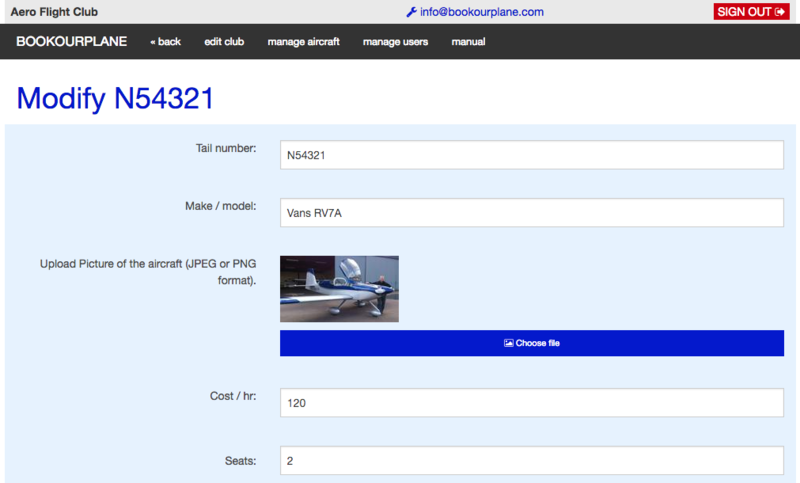 I am very happy that your club is using Bookourplane for your aircraft bookings! 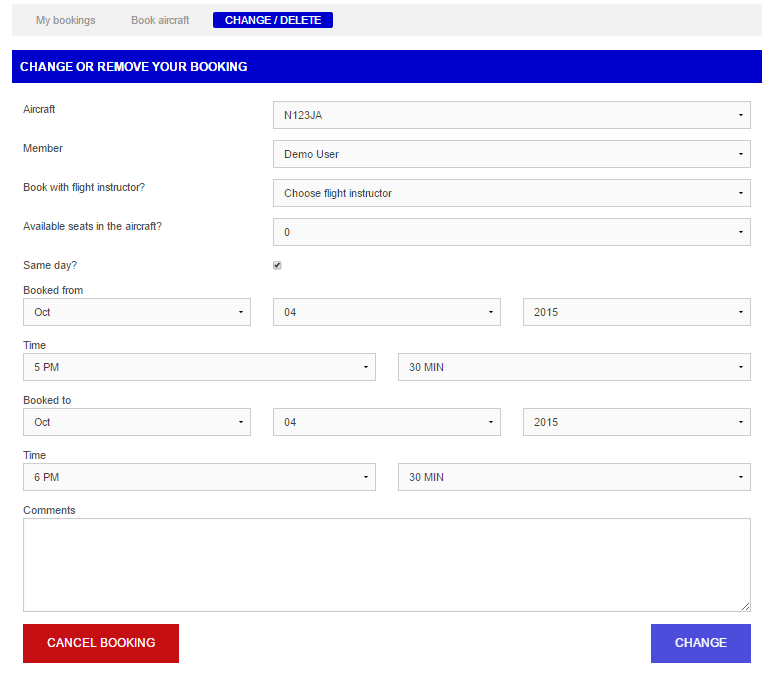 This user guide was written to help you and your flight club members to get started as quick as possible with online aircraft bookings. I am updating the guide regularly, so make sure you read the online version and not a downloaded one. For support and technical issues, please see the last page. When you sign in for the first time you should adjust your personal settings. You do this by clicking on your email address in the top of the screen. Select what aircraft and the flight instructors you wish to see in the calendar. By hiding an aircraft you will also not receive emails when someone post an aircraft message or book that particular aircraft. You can also select what calendar view you wish to see when after you have signed in. Select the date format you wish to use in the system. You can choose between US and European date format. Select time format you wish to use in the system. You can choose between AM/PM or European/military time format. Your account can have up to two emails associated with it. This way you can receive notifications to your work email (example). You can also choose not to receive emails on bookings or club / aircraft messages. Remember that you can also stop receiving emails for certain aircraft by hiding them (see previous paragraph). Remember that if your administrator has set the global email settings to not send any emails on bookings, you will not receive emails unless there is a club or aircraft message. You can use the same email with other clubs in our system, but you need to use different passwords. If you accidently set the same password for another club, just reset your password and pick a new password. Then depending on what password you login with will be what determines what club you access. We recommend to use another email if you are a member of more than one club. This is where you enter all your details that are shown in the your clubs member list. Keep this information updated so that your flying club members knows how to contact you. Your password must be between 6-20 characters and contain at least 1 uppercase and 1 digit. All passwords are encrypted and can not be viewed by anyone. The main navigation consists of 9 menu items. Depending if you are using your mobile device or your desktop the look of it changes; however, the menu items stay the same. Sub menu items such as aircraft callsigns are shown as buttons below the main menu. 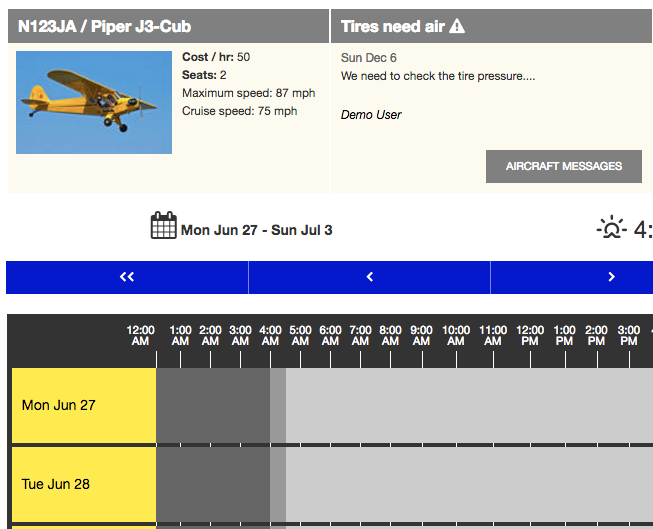 Flight training, gives a weekly calendar view of your club’s flight instructor schedule. Members can book flight training with an instructor here. My bookings, a list view of your own bookings. You can modify any future bookings as well as export to Excel all your bookings. Members, a list view of all your club’s members along with their addresses, email and phone numbers. 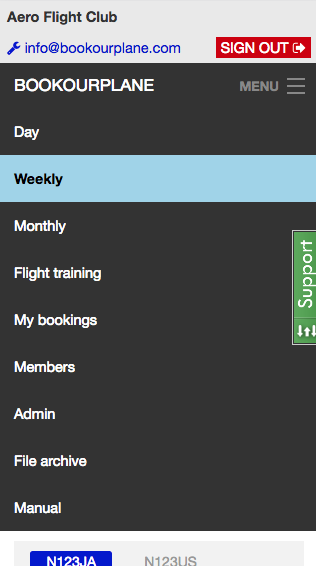 Admin, this is the admin part of Bookourplane that is only shown to your club's administrators and aircraft managers. File archive, this is where you can upload files to the file archive. The booking calendar differs depending on what device you are using. Standard features are a datepicker + sunrise / sunset times for your location. The calendar have day, twilight, and night shown in different shades of blue. Sunset is calculated from the airfield location in the admin section. You can choose between daily, weekly or monthly view. Bookings and other events in the calendar are color coded as follow. FLIGHT TRAINING - times you have booked aircraft for flight training with an instructor. OTHERS FLIGHT TRAINING - other people’s times where they have booked aircraft for flight training with an instructor. FLIGHT TRAINING ONLY - the aircraft can be booked, but only for flight training with an instructor. 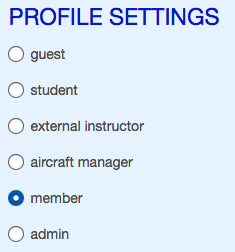 Bookourplane uses profiles and each member belongs to a certain profile with associated permissions. Only the administrators of your club can change the profile of a user. The roles and their permissions are as follows. External instructor - schedule times when available for flight training, no regular booking. Aircraft manager - same as member, but can manage the aircraft fleet also, schedule service etc. 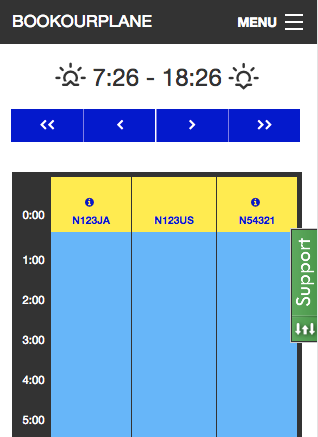 Click on the horizontal bar (vertical if on a mobile device) at the start time and with correct aircraft selected (day view). If you have “weekly” calendar view, select aircraft first (see below). 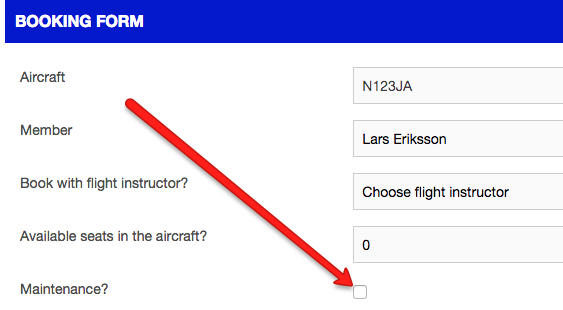 If you have the monthly view, click the date you wish to book the aircraft, then click the “Book Aircraft” button. After clicking calendar you’ll see the booking form where you select start and stop dates / times. 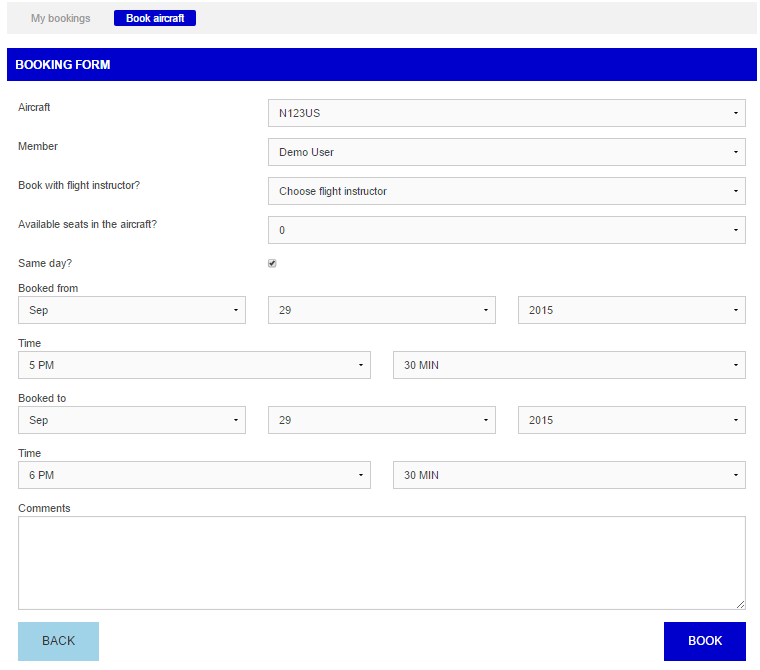 Click “book” to book aircraft, that’s it! A mail will now go out to all members in your club who have chosen to receive emails from Bookourplane. 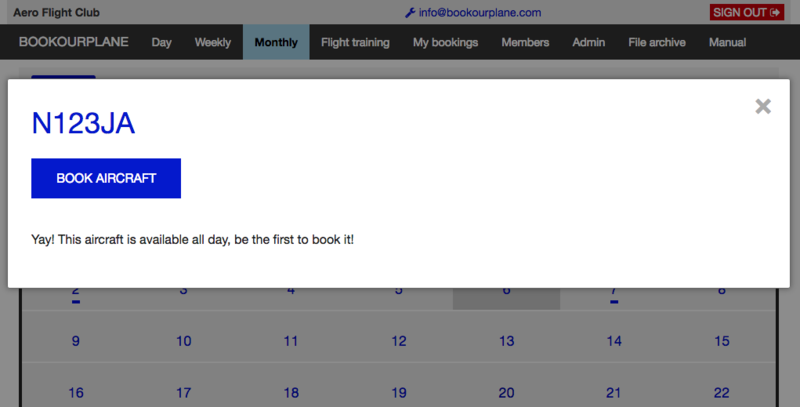 You can either click the booking in the calendar or go directly to the main menu item “my bookings”. Here you will find buttons to either delete or modify a booking. Old bookings can not be changed or deleted. Remember that an email will be sent to all members who have chosen to subscribe to aircraft bookings. You can also cancel a booking from the booking form. If you are a flight instructor you can manage the times when you are available or absent for flight training. You can set a recurring time like Saturdays between 09AM .- 1PM that you are available for flight training. You can also set non-recurring time, like October 2nd, between 3PM - 4PM. To set your schedule click the wrench next to your email up on top of the page. Then click “Add new time slot”. 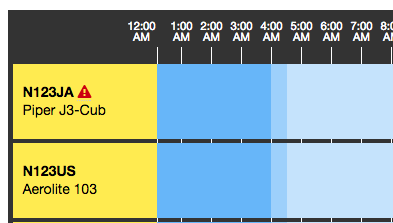 The time you set as available will be shown in the flight training calendar. Student pilots can choose which flight instructor's schedule they want to see and book flight times with them. 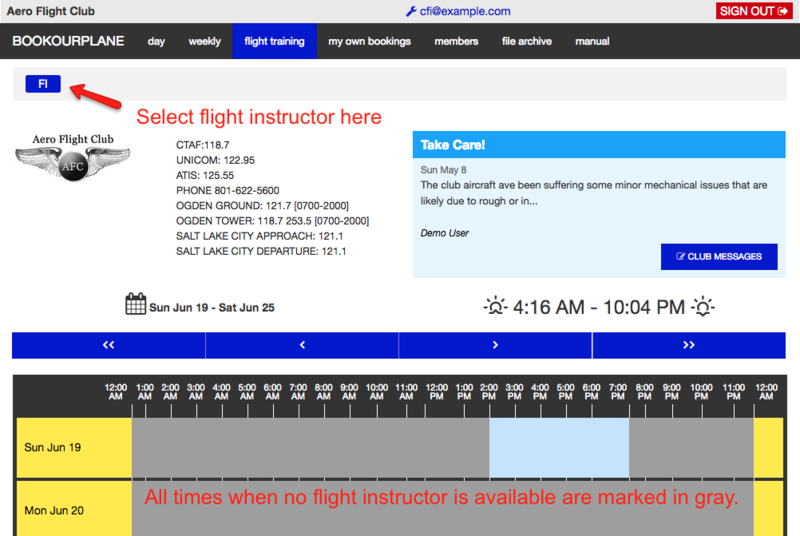 Times when there are no flight instructors available are shown in gray and can not be booked. The top left arrow is pointing to the initials of the flight instructor with initials are “FI” and whose schedule is shown in blue below. As a flight instructor you have the powers to set an aircraft to be bookable for flight training only. To do so, just do a regular booking, but tick the checkbox below. To remove the reservation, just click the timeslot in the calendar to open the booking form, there you will find a red delete button for the reservation. Timeslots marked with “bronze” color indicates that the aircraft can only be booked for flight instruction. As an admin or aircraft manager you can schedule an aircraft for maintenance. To do this, just tick the checkbox in the booking form. The aircraft has scheduled maintenance indicated by the “magenta” color and the letter “m”. Keep your members up to date with your aircraft’s status by posting ‘aircraft messages’. To do this, simply go to the booking calendar. If you have the weekly view you can just click on ‘aircraft messages’ and begin to write a new message. This Piper Cub has a message with “High” priority, indicated with the color red. If you are in the daily calendar view, click the aircraft tail number on the left to begin writing a new message. The red triangle icon is indicating a message with high priority. Aircraft messages have different priority, Low, Medium, High and Grounded. Messages are sorted always by priority and date. Example, a message with priority “High” will be listed above a message with priority “Low”. If messages have the same priority they are sorted by date and time. If you choose to ground the aircraft it will no longer be bookable. Grounded aircraft have a grayed out calendar. All members can write aircraft messages. Only the creator, an admin or the aircraft manager can change the priority or delete other people's aircraft messages. 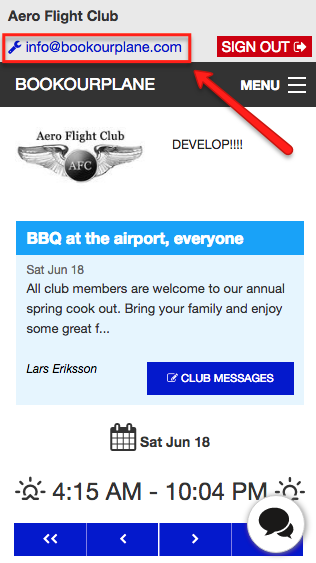 New aircraft messages are emailed to all members of your club who have chosen to subscribe to aircraft messages. The aircraft is no longer bookable if it’s grounded, the calendar shows this with the color gray. With club messages you can inform other members about different club activities. To write a new club message, just click the club message button. All new messages are emailed to your members who have chosen to subscribe to them. Only the author or club administrators can remove club messages. 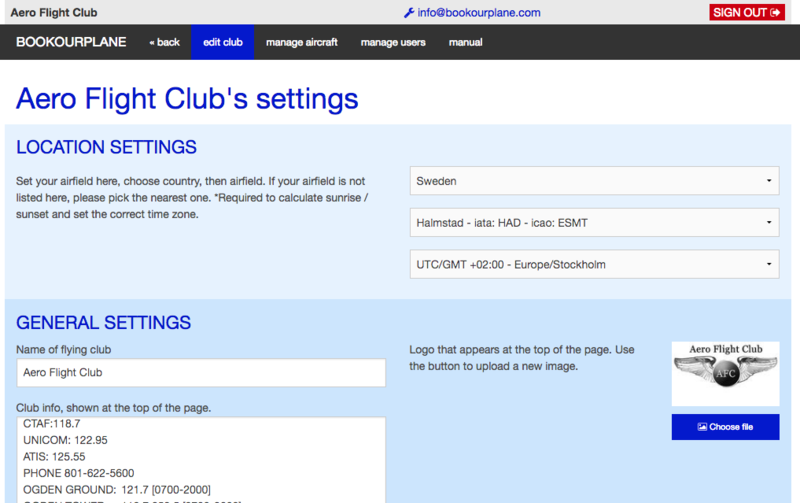 The admin interface is for the administrator and aircraft manager of your club. 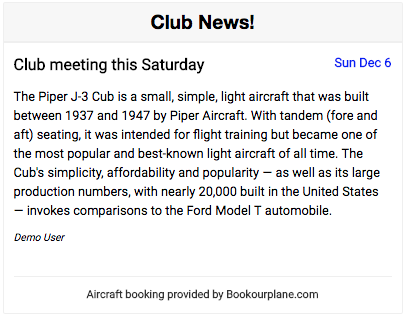 Here aircraft can be added / removed, member and club information updated. Important! 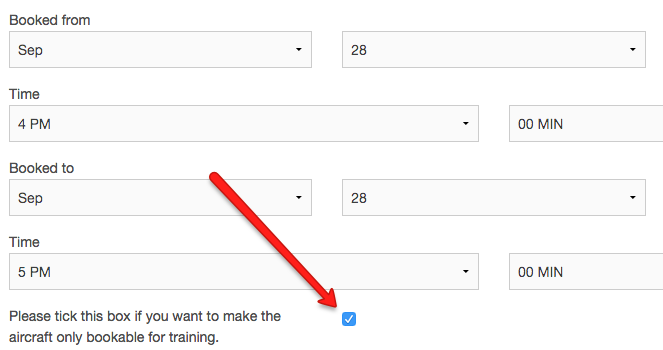 If a setting is changed it might be required for you to logout and back in again to see the changes. Add, modify or delete users here. Users highlighted in blue are the ones that have requested to be added to your booking system. You can choose “Edit” and then activate them. Users who should not be in your system you can delete by clicking the red “Delete” button. By clicking the yellow button you are presented with a link to your clubs “add me” page. This is where you should send the users to fill out their account details. An easy way for you to let your members sign up can be to post this link on your club’s home page or Facebook page. When you have selected a user you can change almost every aspect. Everything but the password is possible to edit. Enabled: Set to “Yes” or “No”. If the user is not enabled he/she will not be able to log in to the booking system. User profile: Here you select what permissions the use should have. The default profile is “Member”. You can read more about the different profiles here. Flight instructor: Set this to “Yes” if the user should be able to set flight instructor schedules. Also enter the initials of the flight instructor (shown to all members in the calender). Here you can add to / delete from and modify your aircraft fleet. The most important setting when it comes to aircraft is that it should have a unique tail number. This is usually the N-number and should be used to identify the aircraft in the booking system. You should also upload a small image of the aircraft that will be shown in the weekly view. You can also set the aircraft sort order. This is a number that indicates the sort order of the aircraft in the booking calendar. The aircraft with the highest number will be displayed at the bottom of the calendar. New in this version of our software is that you have an extra setting for the Time Zone. This is important for the Sunrise / Sunset calculation. If your calendars Sunrise and Sunset is not correct, make sure you have the right time zone selected. As for airport choice you should pick the airport that matches your base. If your airport is not listed you can file a support ticket and I will add your airport. If you operate from a small private field you can pick the airport closest to your location. I have created some useful widgets for your club’s home page. You will find the codes to use at the bottom of your club settings page. Just copy them and send to your webmaster. Displays your clubs aircraft bookings for the current date. 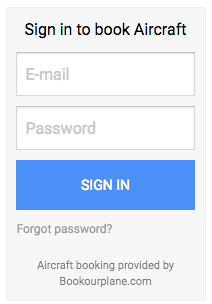 Display a login form on your home page so that your members can log in directly. Display your latest club message on your home page. To file a support ticket, please click on the “Support” button to the right in your browser.